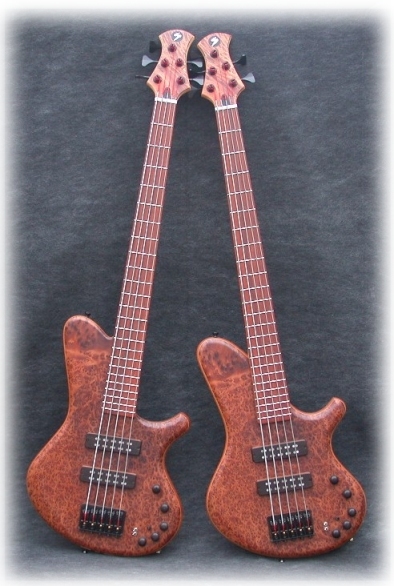 We asked Chris Stambaugh to build 2 basses as exactly the same as possible. Same woods, from subsequent cuts, same electronics, same dimensions. The difference? The point? Well, one is a bolt-on, one is neck-thru. We were curious to hear the difference. Going into this little experiment, we carried some presuppositions. Where they reinforced by the results? I think they were, but 5 years ago, I would have expected a different result. 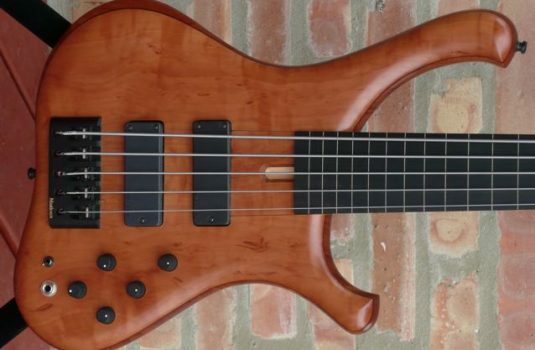 Have I changed , or has bass construction progressed ? I’m not sure. Back to the basses. Both are oil finished Mahogany bodies with gorgeous Thuya Burl FULL-FACE (NOT merely bookmatched) TOPS and matching headstock veneers. 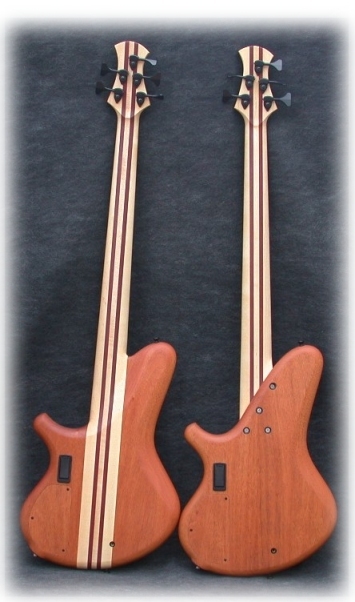 The necks are 35″ scale Maple, with Purpleheart runners. 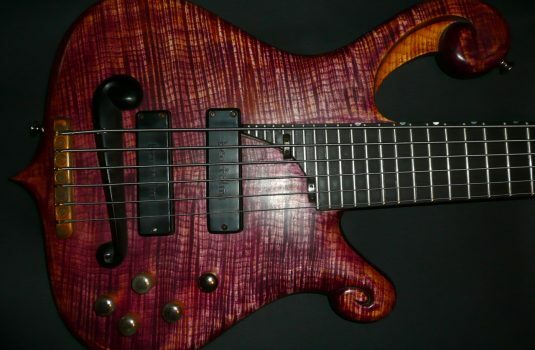 The fretboards are Cocobolo. The pickups are by Aero, their K series. These can be used as single coil or humbuckers, with each having a 2 position toggle switch. Great sounding pickups. 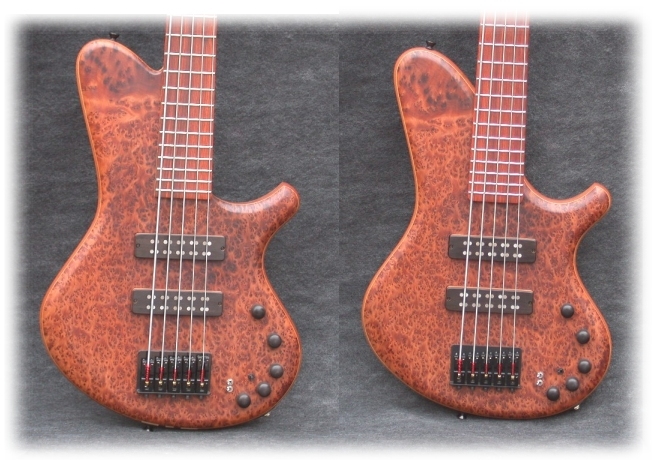 The preamp is the Bartolini NTMB, with a 3 position mid frequency selector toggle. Black hardware, Hipshot tuners, Schaller 2000 bridge. Have you seen this bridge yet? Very nice! 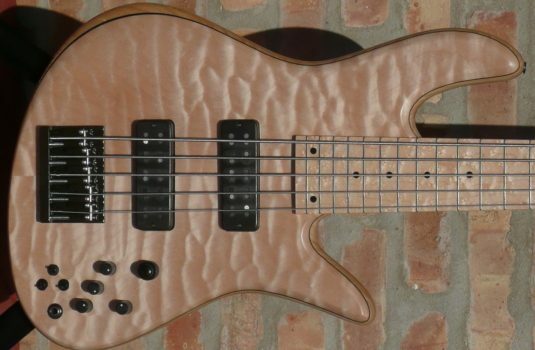 Try to find more bass for the bucks. go on, try. 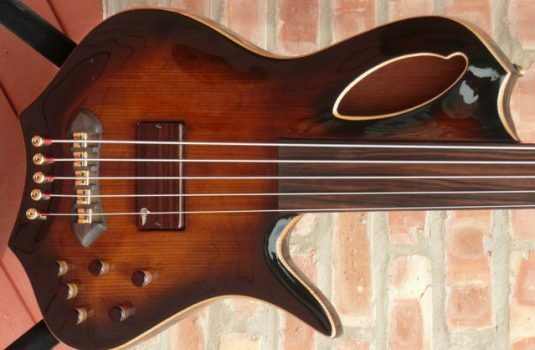 *NOTE – In front facing pictures, neck-thru is bass on left.